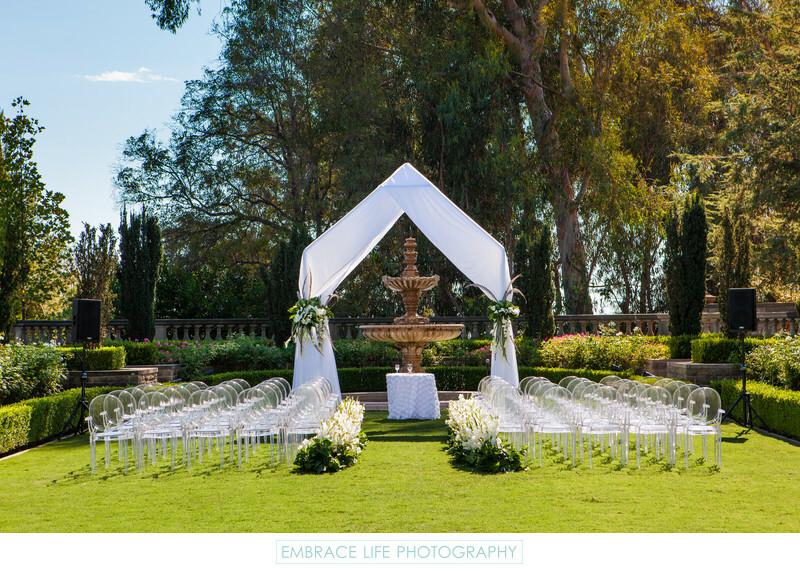 A gorgeous, modern wedding ceremony in Beverly Hills, California, designed by Annette Garcia-Kerslake, of Simply Natural Events, fits the elegant, formal outdoor garden environment of Greystone Mansion surprisingly well. The white structure beneath which the bride, groom and their wedding officiant would stand as the couple exchanged their marriage vows, perfectly frames the European style fountain. Beneath the arch sits a table with communion elements on top of a textured, white table linen. Tied to each side of the structure are beautiful flower arrangement including the interesting touch of black and white feathers, by Gilly Flowers. Gorgeous white flowers with greenery line the ceremony aisle and the super cool ghost chairs.